The function_score allows you to modify the score of documents that are retrieved by a query. This can be useful if, for example, a score function is computationally expensive and it is sufficient to compute the score on a filtered set of documents. To use function_score, the user has to define a query and one or more functions, that compute a new score for each document returned by the query. See Function Score Query for a list of supported functions. Boost for the whole query. The scores produced by the filtering query of each function do not matter. Because scores can be on different scales (for example, between 0 and 1 for decay functions but arbitrary for field_value_factor) and also because sometimes a different impact of functions on the score is desirable, the score of each function can be adjusted with a user defined weight. The weight can be defined per function in the functions array (example above) and is multiplied with the score computed by the respective function. If weight is given without any other function declaration, weight acts as a function that simply returns the weight. In case score_mode is set to avg the individual scores will be combined by a weighted average. For example, if two functions return score 1 and 2 and their respective weights are 3 and 4, then their scores will be combined as (1*3+2*4)/(3+4) and not (1*3+2*4)/2. The new score can be restricted to not exceed a certain limit by setting the max_boost parameter. The default for max_boost is FLT_MAX. By default, modifying the score does not change which documents match. To exclude documents that do not meet a certain score threshold the min_score parameter can be set to the desired score threshold. For min_score to work, all documents returned by the query need to be scored and then filtered out one by one. The function_score query provides several types of score functions. On top of the different scripting field values and expression, the _score script parameter can be used to retrieve the score based on the wrapped query. "source": "params.a / Math.pow(params.b, doc['likes'].value)"
Note that unlike the custom_score query, the score of the query is multiplied with the result of the script scoring. If you wish to inhibit this, set "boost_mode": "replace"
The weight score allows you to multiply the score by the provided weight. This can sometimes be desired since boost value set on specific queries gets normalized, while for this score function it does not. The number value is of type float. The random_score generates scores that are uniformly distributed in [0, 1[. By default, it uses the internal Lucene doc ids as a source of randomness, which is very efficient but unfortunately not reproducible since documents might be renumbered by merges. In case you want scores to be reproducible, it is possible to provide a seed and field. The final score will then be computed based on this seed, the minimum value of field for the considered document and a salt that is computed based on the index name and shard id so that documents that have the same value but are stored in different indexes get different scores. Note that documents that are within the same shard and have the same value for field will however get the same score, so it is usually desirable to use a field that has unique values for all documents. A good default choice might be to use the _seq_no field, whose only drawback is that scores will change if the document is updated since update operations also update the value of the _seq_no field. It was possible to set a seed without setting a field, but this has been deprecated as this requires loading fielddata on the _id field which consumes a lot of memory. The field_value_factor function allows you to use a field from a document to influence the score. It’s similar to using the script_score function, however, it avoids the overhead of scripting. 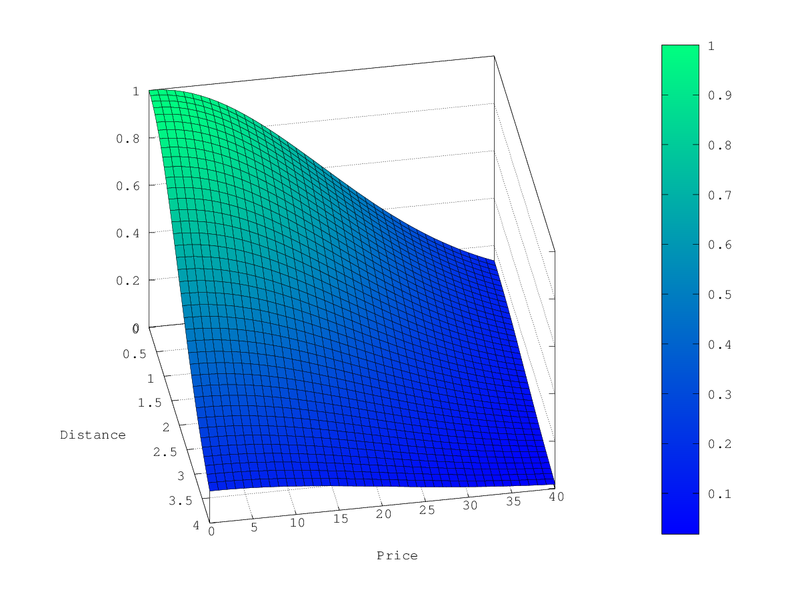 If used on a multi-valued field, only the first value of the field is used in calculations. Field to be extracted from the document. Optional factor to multiply the field value with, defaults to 1. Modifier to apply to the field value, can be one of: none, log, log1p, log2p, ln, ln1p, ln2p, square, sqrt, or reciprocal. Defaults to none. Value used if the document doesn’t have that field. The modifier and factor are still applied to it as though it were read from the document. Decay functions score a document with a function that decays depending on the distance of a numeric field value of the document from a user given origin. This is similar to a range query, but with smooth edges instead of boxes. The DECAY_FUNCTION should be one of linear, exp, or gauss. The specified field must be a numeric, date, or geo-point field. The date format of the origin depends on the format defined in your mapping. If you do not define the origin, the current time is used. The offset and decay parameters are optional. The point of origin used for calculating distance. Must be given as a number for numeric field, date for date fields and geo point for geo fields. Required for geo and numeric field. For date fields the default is now. Date math (for example now-1h) is supported for origin. Required for all types. Defines the distance from origin + offset at which the computed score will equal decay parameter. For geo fields: Can be defined as number+unit (1km, 12m,…). Default unit is meters. For date fields: Can to be defined as a number+unit ("1h", "10d",…). Default unit is milliseconds. For numeric field: Any number. If an offset is defined, the decay function will only compute the decay function for documents with a distance greater that the defined offset. The default is 0. 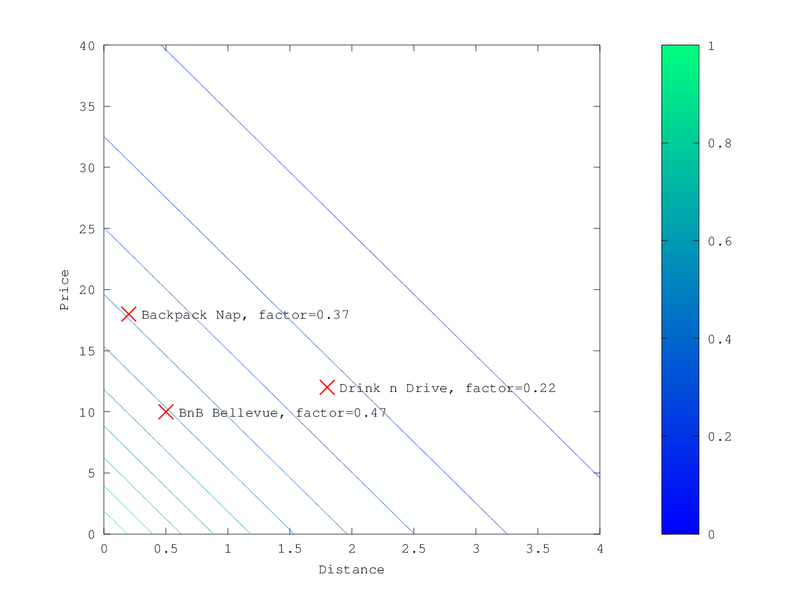 The decay parameter defines how documents are scored at the distance given at scale. If no decay is defined, documents at the distance scale will be scored 0.5. In the first example, your documents might represents hotels and contain a geo location field. 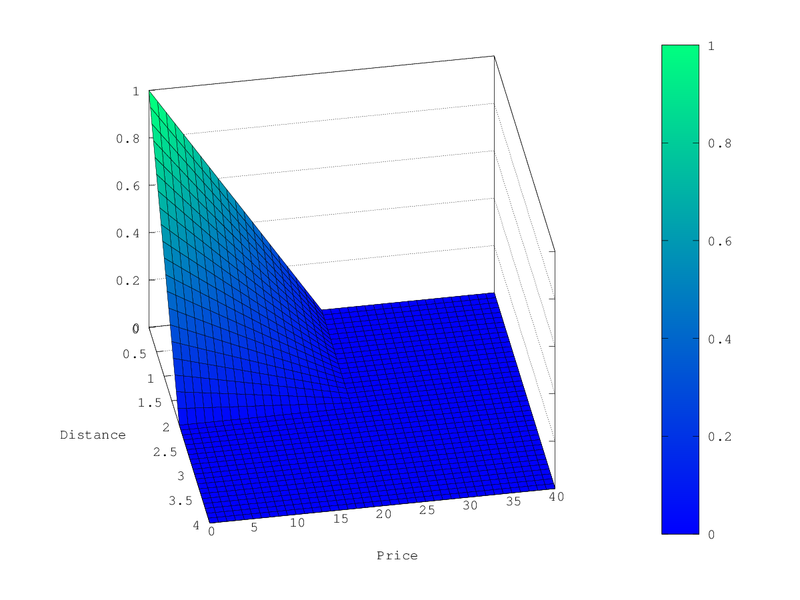 You want to compute a decay function depending on how far the hotel is from a given location. You might not immediately see what scale to choose for the gauss function, but you can say something like: "At a distance of 2km from the desired location, the score should be reduced to one third." The parameter "scale" will then be adjusted automatically to assure that the score function computes a score of 0.33 for hotels that are 2km away from the desired location. In the second example, documents with a field value between 2013-09-12 and 2013-09-22 would get a weight of 1.0 and documents which are 15 days from that date a weight of 0.5. 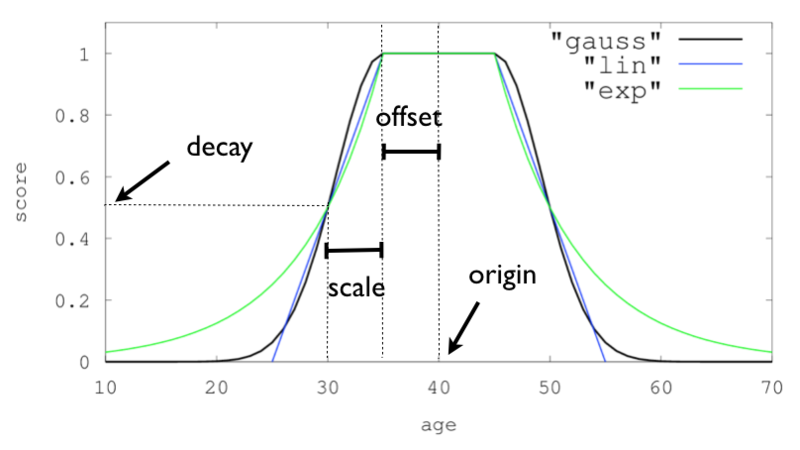 See Normal decay, keyword gauss for graphs demonstrating the curve generated by the gauss function. 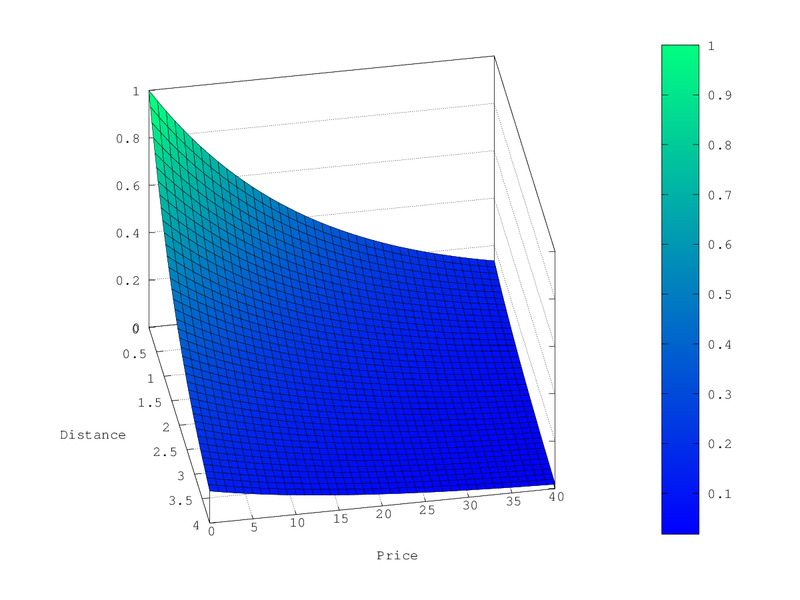 See Exponential decay, keyword exp for graphs demonstrating the curve generated by the exp function. In contrast to the normal and exponential decay, this function actually sets the score to 0 if the field value exceeds twice the user given scale value. If a field used for computing the decay contains multiple values, per default the value closest to the origin is chosen for determining the distance. This can be changed by setting multi_value_mode. Suppose you are searching for a hotel in a certain town. Your budget is limited. Also, you would like the hotel to be close to the town center, so the farther the hotel is from the desired location the less likely you are to check in. You would like the query results that match your criterion (for example, "hotel, Nancy, non-smoker") to be scored with respect to distance to the town center and also the price. Intuitively, you would like to define the town center as the origin and maybe you are willing to walk 2km to the town center from the hotel. In this case your origin for the location field is the town center and the scale is ~2km. If your budget is low, you would probably prefer something cheap above something expensive. For the price field, the origin would be 0 Euros and the scale depends on how much you are willing to pay, for example 20 Euros. In this example, the fields might be called "price" for the price of the hotel and "location" for the coordinates of this hotel. This decay function could also be linear or exp. Next, we show how the computed score looks like for each of the three possible decay functions. "Drink n Drive" is pretty far from your defined location (nearly 2 km) and is not too cheap (about 13 Euros) so it gets a low factor a factor of 0.56. "BnB Bellevue" and "Backback Nap" are both pretty close to the defined location but "BnB Bellevue" is cheaper, so it gets a multiplier of 0.86 whereas "Backpack Nap" gets a value of 0.66. Only numeric, date, and geo-point fields are supported. If the numeric field is missing in the document, the function will return 1.